We spent 284 hours researching and testing lacing techniques for running shoes. Here, you’ll find our best recommendations. Enjoy. In running, there are a lot of factors that could secure the fit and comfort of the feet. Even if your shoes feel great during your first try, there could be times that the upper construction will rub on your foot the wrong way. Each pair of feet is unique, which is why using the right lacing technique and proper knots will matter in your running performance. In this article, you will learn to relieve the foot fatigue or nagging pain by adjusting the laces right. Despite being a minor issue, getting the lacing perfectly will make a big difference in the overall comfort and support of your shoes. We have reviewed some scientific studies to present the results of these investigations for the best lacing techniques and their influence on running experience. Choosing the right shoe type and sizing will basically provide you with better performance and comfort; however, if you want to maximize them for the long haul, mastering the right lacing techniques will keep you in your top shape on the trail or track. Not all shoes are created to accommodate every foot size. Adidas Ultra Boost Uncaged and New Balance Fresh Foam Cruz are different. In fact, there are instances when there are areas wider or tighter than the other. This can be quite tricky, especially if your foot does not have the standard size. narrow-footed runners will not dwell on wide measurement problems anymore. With the lacing techniques shown in this article, you can secure a compact fit and ensure a well- supported ride on the track and trail. If you feel high pressure at the forefoot you might find this lacing useful. On the other hand, if your feet are wide in general, the lacing below can solve your inconveniences. Wide forefoot is not an uncommon problem and some brands offer wider shoes models. If this kind of lacing doesn’t help you, probably you could try some of these shoes for wide feet like Nike Free 5.0. Having narrow feet, on the contrary, means that even if you get the length properly, there is a possibility that a running shoe will feel roomy at the heel, forefoot, or it may even be a combination of the two. Though women encounter this issue more often, anybody can find too much volume in his or her shoe. This lacing technique can aid you in perfecting the grip for a narrow foot. Although, having narrow feet is a less popular discomfort, some brands do provide models satisfying this need. Bear in mind that you need more room when it comes to running. Having a compact shoe is a must; however, if you cannot flex normally or the shoe hinders you from proper toe splaying, this could affect your performance. Make sure to ease the pressure of the lacing. Lacing that is too tight may seem to keep your feet from slipping; however, this could hinder the normal blood flow, leading to numbness and bruising in the end. Learn to flex your foot inside your shoe before hitting the course and see to it if you are comfortable enough with the interior. If not, adjust the lacing system to fit your needs. Runners have varying arch types. There are high to low arches, which affect the overall performance. First and foremost you need the right shoe for pronation control. But that’s not it: you would also need to implement proper lacing technique to keep your foot from foot fatigue. Many people may not know it, but there are lacing techniques that work better with specific arch types. Under pronators or supinators commonly have high arches, which means they are vulnerable to the outward foot roll motion while running. This lacing technique above will help the shoe provide decent support to prevent supination from getting in the way of comfort. Sometimes having high arches means that every pair of shoes rubs the upper part of your feet, thus keeping you from enjoying running. That needs to be changed. See this. This lacing is also called “parallel lacing” or “lydiard lacing”, and many runners use it daily to ease the pressure at the top of the shoe and perfect their run. Over pronators will benefit from the lacing technique for high mid-foot in order to improve stability on the track or trail. Finish the lacing off by securing the top holes to ensure that your mid-foot is held in place on the midsole. Yet another common problem is having flat feet. Some people assert that stability shoes is what you need to look for, the other claim that barefoot or neutral is a better option. A whole industry is aimed at relieving you from this pain-problem with special types of shoes and orthopedic soles. There is no definitive answer to this question, though we may advise you a lacing technique helping to prevent overstretching of plantar fascia and medial tendons traumas. This special lacing technique for flat feet can advance your experience. Another small tip: you can try to follow any advice given to overpronators. Fixing your feet this way may relieve you from discomfort after a run. Whichever type of arch you have, the main thing to keep in mind is that when you put on and lace your shoes, it should bring you the air of self-confidence. Don’t you dare to start a run until your feet feel secure and you are ready for action! Keeping the foot in place is absolutely crucial while in motion. Heel slipping may result in instability and distraction, which may eventually lead to accidents. That’s where this technique can come in handy. And there’s more to it. It has been scientifically asserted, that using the 7th lace hole and making a loop lacing lock can enhance your performance. University of Duisburg Essen in Germany presented interesting results as to how the lacing tightness and the number of laced eyelets influence the effectiveness of running shoes in use. They say 7-eyed lacing with tight grip is better than regular 6-eyed one in reducing the risk of lower limb injury, and it feels just as comfortable. You can read the full study here. Furthermore, it was experimentally proven that using runner’s loop lacing technique can boost your foot stability, improving the quality of your run. This study by The American Sports Medicine Institute and Auburn University School of Kinesiology also claims that this 7-eyed lacing is of help in reduction of plantar and dorsal pressure. Don’t be afraid to lace your shoe tight. As is shown in this particular study by the Dutch EMGO Institute for Health and Care Research, more secure, tighter lacing is recommended even for diabetic runners. It works well because comfortably tight grip reduces plantar pressure and in-shoe displacement. Painful cramping can be battled with shoes’ lacing adjusted for better toe splaying. With more space available in the forefoot there is lesser risk of toe pains and no numbness to deal with. This technique is a great tool for battling black nails and forefoot discomfort. Try it out. 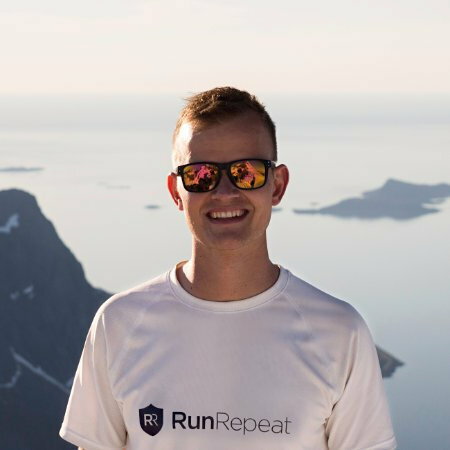 Any habitual runner will agree that at some point his feet were still feeling sore after the previous run when he or she was about to hit the road as usual. Foot fatigue is a natural issue, and everyone becomes its victim sooner or later. We might be able to offer you a tiny tool that really helps with swollen feet - a lacing technique designed for the cases like this. Now your willpower is not challenged by another issue: feet are placed right, and the road awaits. Go for it! While there are some models that have skipped the lacing system altogether, most athletic shoes will require you to lace down the front to prevent the shoe from being dislodged. This technique can help runners adjust their shoes if one area is too tight. By applying it right, you can even out the pressure and avoid foot fatigue. There are runners comfortable with more room and breathability in the interior of the shoe when it comes to running. For their demands their is a supply: a special lacing technique, that allows changing the tightness of the grip during the run. You can adjust it by pulling or loosening the laces to adapt the shoe to your feel. Some shoes have lace pockets to keep your laces out of the way. This will minimize the distraction and lessen the chances of stepping on them. If your shoes do not have lace pockets, make sure to tuck them in before you start your course. Needless to say, no matter how perfect is the fit of the shoe, constantly untangling laces’ ends can drive you nuts, and take all the tranquill of your beloved run. 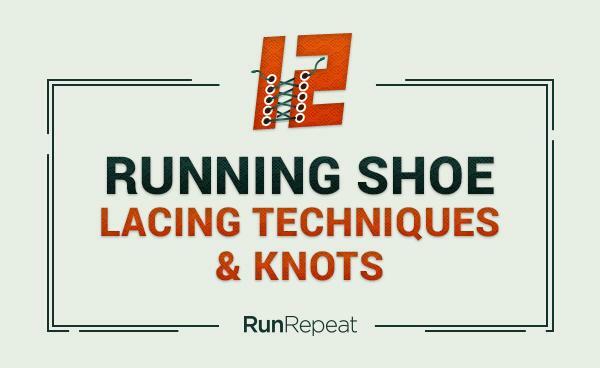 We browsed hard and came up with the best ways to tie running shoes, and tested them. There are plenty of ways to tie your shoes, even better - there is a wonderful portal, dedicated solely to tying your shoes in 1000+ different ways. However, when it comes to running security is put forward, and we have selected the 3 best ways to tie your running shoes fast and lasting. First one is the Ian knot. It is known on the web as the perfect way to make a bow before you clip your eyes once. It is fast, easy to do and let’s agree on this: we do need our lacing to be complete with a knot that takes 1 second from start to finish. Though it isn’t as fast and easy to do as the previous one, we can confirm - this one won’t let your laces go wild on long distances, such as marathon runs, etc. The last, but definitely not the least for us is the Surgeon's Shoelace Knot. This type of laces tangle is fairly similar to the most popular way of tying athletic shoes. Even so, thanks to the additional loop it became a much securer choice for long-distance or treadmill running. Running shoes lacing is not all about crunchy facts. It all started with John H. Halton taking a mathematical approach. He decided to look at laces as if it was a merchant who needed to cover all his businesses, walking on each of them only once, and going back the shortest way. So our “gentleman” starts his course in the upper left hole, and finishes in the upper right one. This small graphic shows the 3 basic lacing techniques. American is the shortest, and therefore takes the 1st place, two next ones share the same lace length. You can find this fun science useful if your laces are too short, and it also works great if the eyelets are suited inconsistently. Perhaps, it’s not the easiest way to buckle up your running shoes, but you can use it to impress friends at a party, or maybe save a life using it. You never know! Some people find that lacing takes up too much time, and they would fancy way how to lace shoes without tying. On October 21 2015 Nike officially announced a release of a perfect treat for this crowd: self-lacing shoes. The idea was not new: back in 80’s Robert Zemeckis released a time-travel movie “Back to the Future”, where the main hero discovers in a far from his perspective 2015 a very fancy pair of Nike self-lacing shoes. This marketing trick worked well for the company, who sponsored the film production. And there’s more to it. Nike keeps working on adaptive lacing, while the first models already made quite a shush on the web. There are a lot of lacing techniques that you can use, depending on what you want to adjust. Bear in mind that not all lacing techniques work for everyone. It is best if you try a technique and do a few runs around the house prior to hitting the pavement. If you still feel discomfort, you can adjust accordingly. 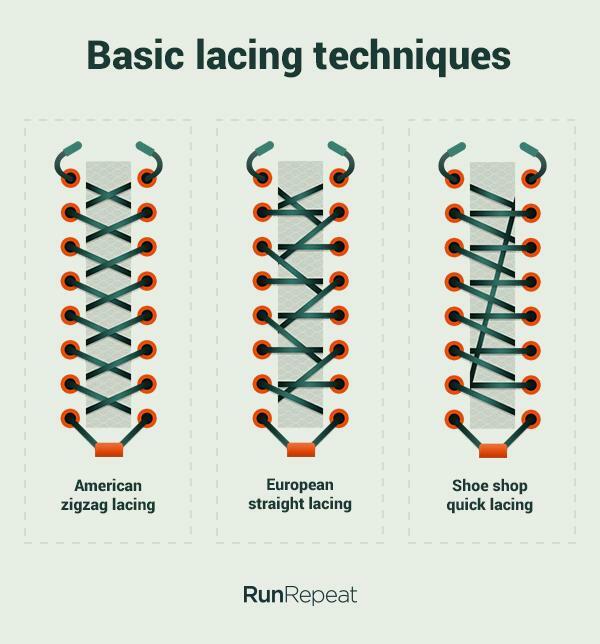 Lacing techniques influence performance, comfort and fit, so make sure to memorize the best ones for your casual or professional running.